Product No. 9308A, AquaGuard (Model 7500). Intertap Quarter Turn Drinking Water Tap with Ceramic Disc Valve for easy, smooth lever operation and greater reliability (as pictured above). 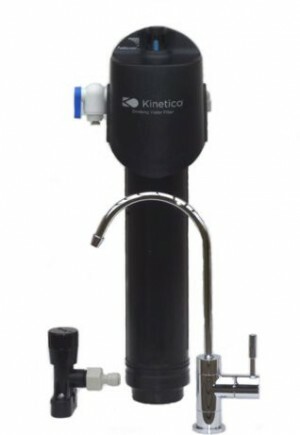 This high quality filter system is a 1 micron block carbon filter to reduce sediment, chlorine, Volatile Organic Compounds (VOC’s) like pesticides and insecticides, heavy metals such as lead and cysts (microscopic single cell parasites) including Giardia and Cryptosporidium. 1850 Litre Capacity per cartridge. Delicious tasting water: Produces clear water ideal for preparing food; perfect for cooking pasta, washing and preparing fruits and vegetables. Independently certified filter: Unlike many other Carbon filters, ours have been independently tested and certified to NSF International Standard 42 to deliver continuous water quality performance throughout the lifetime of the cartridge. Simple and easy to install: Fits easily and neatly under the kitchen sink. Efficient and economical to run: Does not require electricity. Peace of mind: Each filter is fitted with a MacGuard™ which prevents the user from drinking unfiltered water. This unique and patented devise measures the amount of water passing through each filter and stops the flow of water once the filter cartridge is exhausted. Easy filter metering system: Fitted with a PureMometer® which shows you how much filter life remains so you know when it's time to obtain a replacement cartridge. 12 month warranty: On parts excluding filter cartridge and labour.